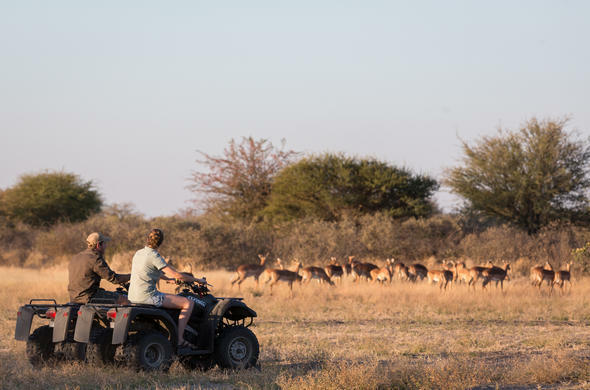 Both large and small game occur in the Central Kalahari, but due to the prevalent climatic conditions, the wildlife is widely dispersed and the groups smaller than usual. A noteworthy animal that has managed to withstand the dry and treacherous climate of the Kalahari is the Springbok. 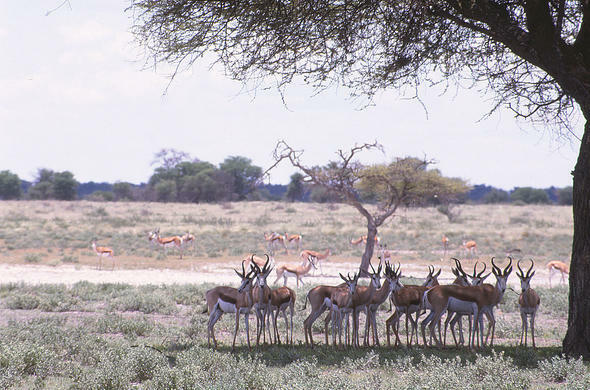 These medium sized brown and white gazelles are also the most numerous herbivores in the region. They are often observed in small, widely dispersed groups during the dry seasons, and gather in large herds during the rainy season to graze on the Makgadikgadi Pans. One of the reasons why the Springbok populate the Kalahari so successfully is owed to their ability to breed rapidly during favorable periods. Their diet consists of tender grasses or shrubs and the Springbok takes advantage of grazing during the night time when these plants contain up to 20% more moisture due to dew. These antelope are also adapted to retain the water they ingest very effectively. 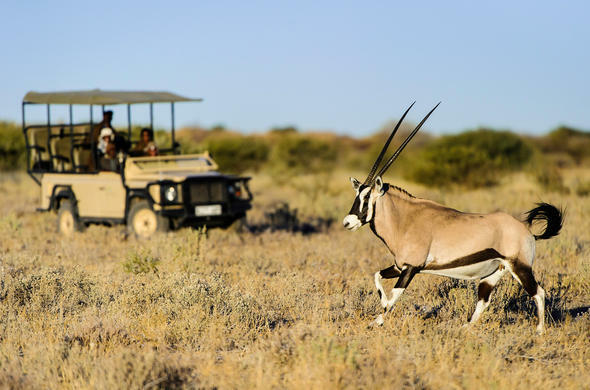 The Kalahari Gemsbok (Oryx) is another example of how advantageously animals have adapted to the Kalahari region. Though larger in size than the Springbok, they inhabit the most challenging parts of the dessert. They are able to do this due to their survival strategies and unique physiological characteristics. Its physical orientation is a way to resist the force of the desert sun. The Gemsbok is sure to always keep the smallest part of its body toward the sun, with the largest part facing toward the breeze in order to reduce its body temperature. During the daytime, they are often found resting in any available shade, so as to best make use of grazing opportunities during the night time. Even more astounding are the unique physiological traits such as the Gemsbok's white underbelly, which reflects heat from the desert sand. Gemsbok also have the ability to raise and lower their own body temperature significantly. This is the result of a unique series of blood vessels at the base of its brain, known as the carotid rete. Blood flowing toward this vital organ is cooled significantly, whilst the rest of its body temperature can go up to 45° Celsius - enough to kill most animals. During the cooler night temperatures, all of the excess heat accumulated during the day is lost. 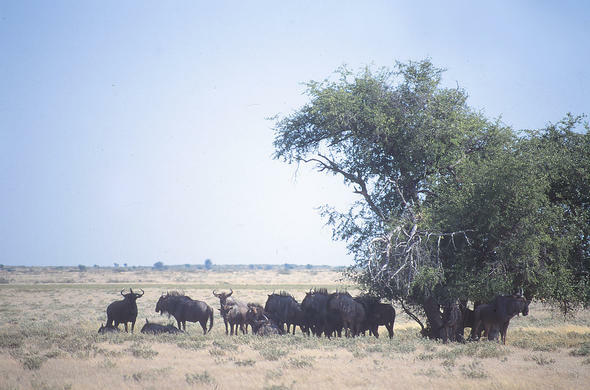 Other herbivores such as the Blue Wildebeest, the Red Hartebeest and the Eland also occur in large herds in the central Kalahari. 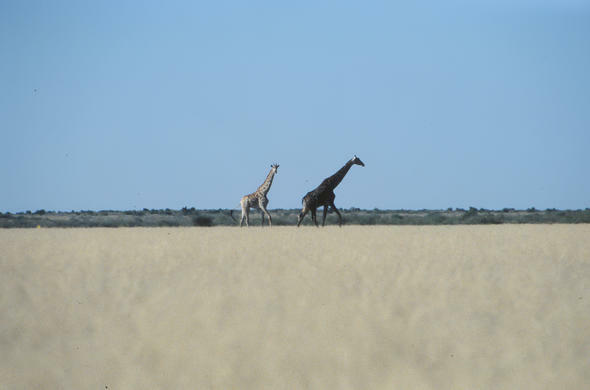 Smaller concentrations of Kudu and Duiker can also be seen and Giraffe are also occasionally seen.